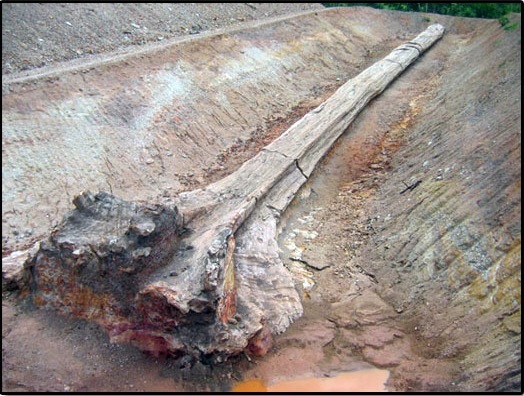 At Bantak Petrified Forest Park, seven large fossil tree trunks have been excavated, including one specimen over 72 meters in length. This specimen is one of the world's largest known petrified tree trunks, and the overall collection of trunks represents one of the best fossil tree sites in the world (see the importance and uniqueness of this site). Unfortunately once these trees were exposed and had become weathered by rain, temperature variations and ground water seepage, the fossilized trunks began to deteriorate. 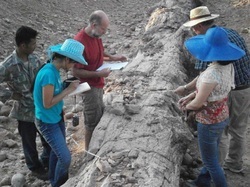 The purpose of this project is to preserve these fossil trees via collaboration of multidisciplinary people who are interested in fossil trees, conservation, geology, and environment. We want to protect this natural heritage site, educate local people, and raise public awareness of how important the fossil trees are for both nationally and internationally. The fossil trees here are also considered as the flagship symbol which can help us to protect the entire forest park if developed to be part of world heritage or a UNESCO Geopark. At present we have written a grant proposal for submission to the Thai government for conservation and building a permanent structure serving as a shelter for preserving the fossil sites as a first step in order to maintain a permanent establishment dedicated to preserving and educating about these exciting and unique specimens. In addition, we hope to gather the volunteers to work together with the current team to perform the research on conservation.